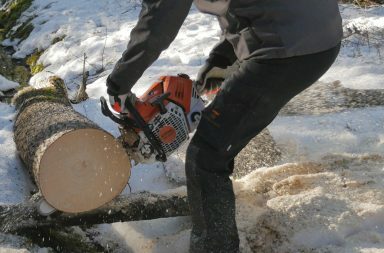 Forestry.com has tested the brand new Stihl MS 500i, the new 80cc chainsaw from the factory in Waiblingen in Germany. The only question is – where to begin? Do you start with the fact that MS 500i is the very first chainsaw on the market to have more horse powers than weight in kilos (dry weight), or the fact that it’s the first chainsaw on the market to feature fuel injection? Well, both have now been said so I guess we’ll continue with the fact that this is a chainsaw that impresses – enormously! Even a skilled chainsaw logger like Lars-Erik Larsson, who have tested the chainsaw on behalf of Forestry.com, is impressed. With a dry weight of most professional chainsaws of the 60-cubic class and with an effect of chainsaws of the 90cc class, this truly is a game-changer. 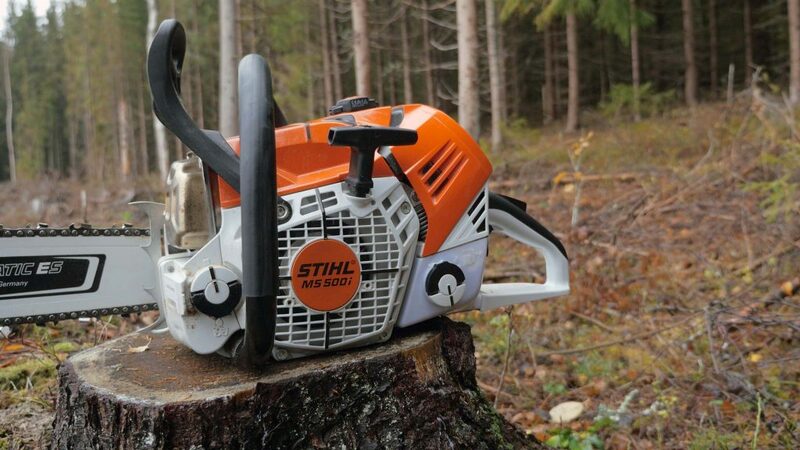 If you add the fact that the carburetor has been replaced with fuel injection thus improving the startup of the saw (no choke) and even made the saw somewhat unstoppably fast in its acceleration, you begin to understand that Stihl might be on to something extraordinary. Despite the saw featuring fuel injection there’s no difference in how it handles compared to a “regular“ chainsaw with a carburetor. The only difference is that there’s no choke and it seems as though the saw starts up more easily. Yours truly had to test the saw the second we got it in our hands, and straight from the box (it had, to be fair, been slightly used though) it started up on the first pull after just a few (around 5) pushes on the primer! I don’t think Lars-Erik needed a single push and it started up on max 2 pulls when cold. Stihl writes in their manual that you should press the primer 8 times before doing a cold start, and on doing so there’s probably a good chance that it will start on the first attempt. 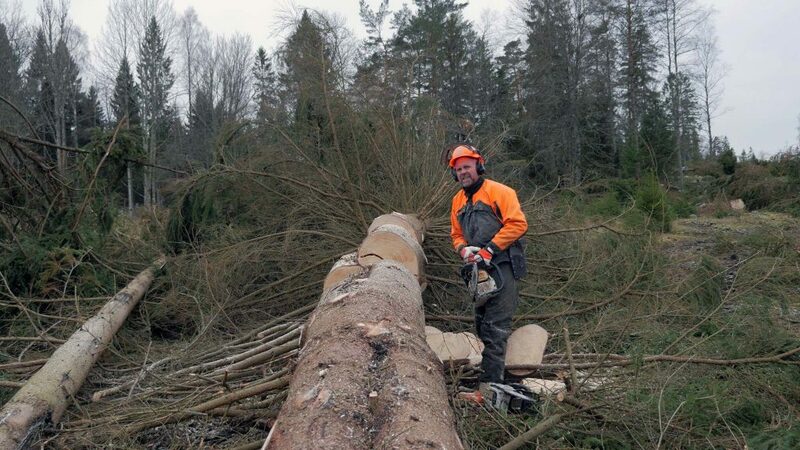 As a comparison Lars-Erik also used the Stihl MS 361 during the test. It needed on average 4 pulls before starting from cold. That’s a significant difference. 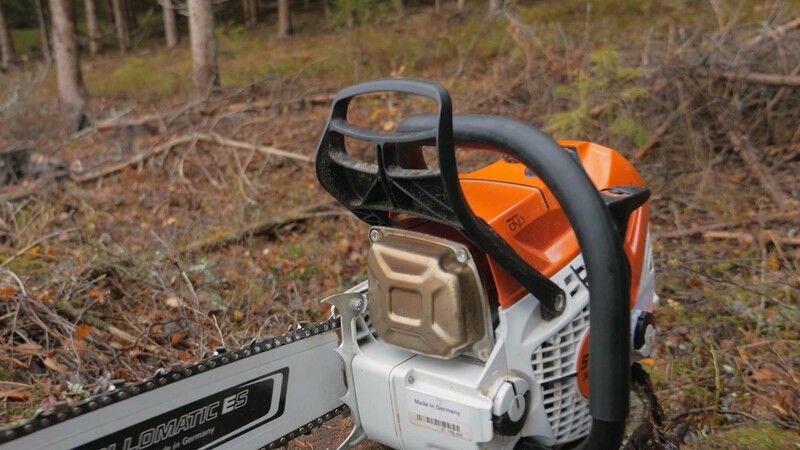 Lars-Erik Larsson, who works as a professional chainsaw logger, has had the privilege of testing the MS 500i. 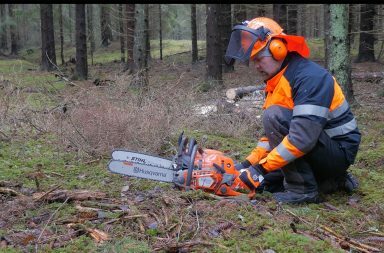 Lars-Erik is also the person who tested the Husqvarna 572XP and Stihl MS 462 on our behalf, so it makes sense that he did the MS 500i as well. There won’t be a long-term test of the MS 500i, that’s important to point out. 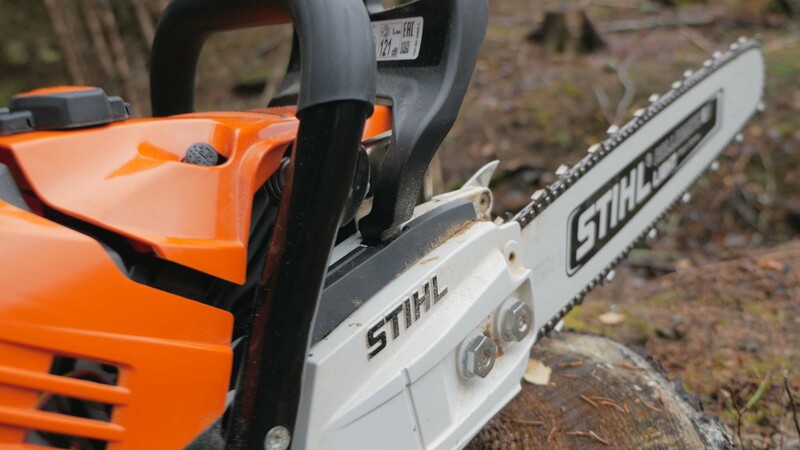 The saw will hit the market sometime during the first half of 2019 and the saw that we borrowed from Stihl seems to be a serial-produced saw, though probably intended for internal showcases at Stihl Nordic. This is why the saw has now been returned to Stihl – thank you very much for letting us try it out! MS 500i was tested in the forests of Dalsland and Värmland in Sweden, in typical November weather, around freezing in a raw and moist environment. The saw has been tested on everything from light final felling to heavy work logging overgrown trees for harvesters. We don’t know how well-used the test saw was and thus it’s difficult to have an opinion on fuel consumption. Considering that the MS 500i uses fuel injections rather than a carburetor, in theory it should run on less than a regular saw. It’s difficult to assess this, and another important aspect is that it has a whopping 6.8 horse powers and the best weight/efficiency ratio on the market. 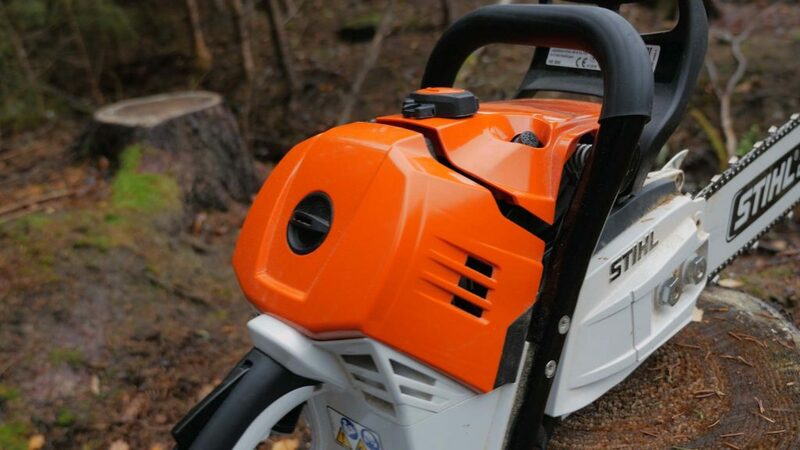 One would assume that Stihl has focused on jerking as much power out of the saw as possible, and of course that would mean it requires more energy. Another factor when testing new saws is that you quickly become blind to just how fast you’re working considering how effective the saw is. Without realizing it you can become much faster at what you do and take down a greater volume within a certain timespan. It’s important to keep an eye on this. We do dare to make a statement based on the test though, and that is that the MS 500i is fuel efficient. Just how efficient is hard to say. It’s not remarkable, though noteworthy. We’ll have to get back on this with more thorough data. 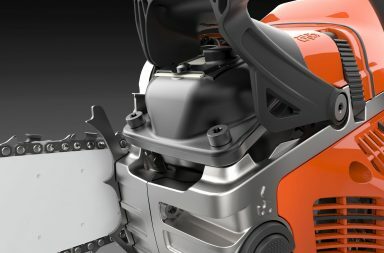 On paper, the MS 500i has an around 13% greater power level than the MS 462 and 17% more power than the Husqvarna 572XP (the saws previously tested in the 70cc class). This is noticeable in the forest, too! The icing on the cake is the acceleration, which is remarkable. As standard the MS 500i will be delivered with a 20” ES Light sword. This is probably an optimal sword for the saw and for the forest in which it was tested. When we tested the 462, Lars-Erik found that 20” (which it, too, had) was a bit over the top for the 462. This is not the case with the 500, because here everything fits well together. It’s hard to get it to choke while in use and it handles very well during pruning. This probably has something to do with the primary power and acceleration. You don’t need to position yourself optimally even on thicker branches. The 500 will cut through it without complaint or getting stuck. Stihl MS 500i was an instant favorite with Lars-Erik. And in reality, it’s enough to just look at the specs of the saw. If it acts even just somewhat according to the specs it will be unbeatable as it outperforms everything else on the market – a potential game-changer. The big question is whether the new injection technology will deliver over time, and if the price of the MS 500i will be within reason. The target price currently listed on the German website of Stihl is EUR 1559, or around $1760 USD. If we’re to trust history, however, the MS 500i will be slightly cheaper in store, perhaps by a couple of hundred dollars. If that’s the case it will land a few hundred dollars above the competitors of the 70cc class. 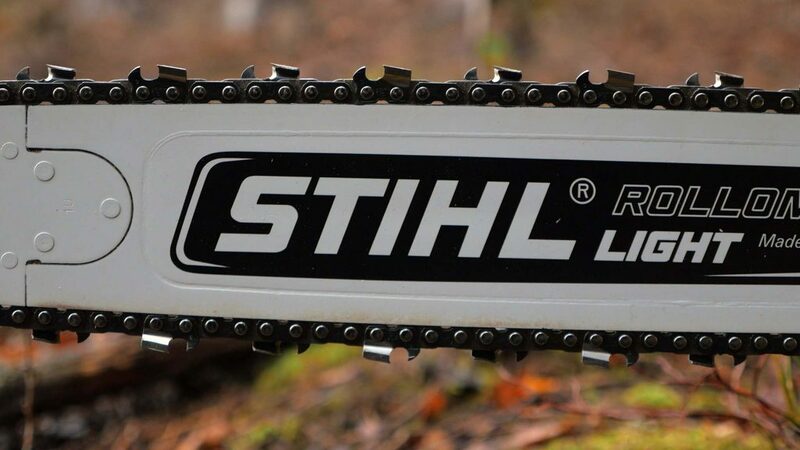 Another thing that Lars-Erik also pointed out during testing is that you have to be careful with the saw chains from Stihl. On the test saw there was a 72-link ⅜ RS chain (20”, Rapid Super, 1.6 mm gauge). This chain requires sharpening relatively often (as with every saw chain), but above all it requires that you follow along and adjust the depth-gauge as it’s being sharpened. 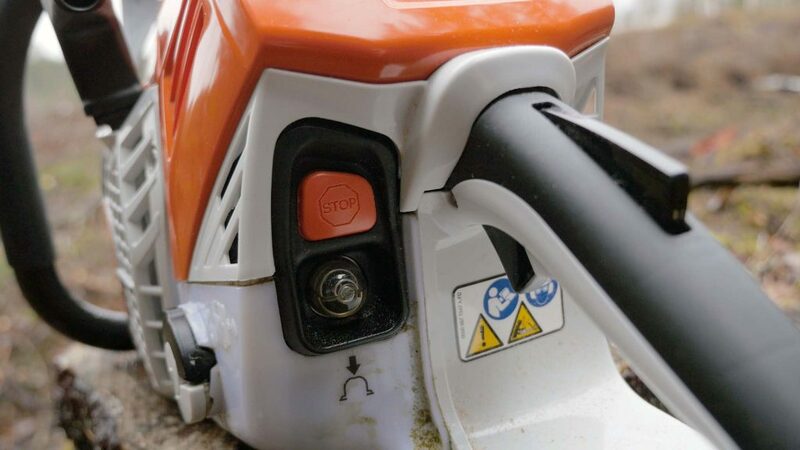 If you don’t do this the risk is that it won’t bite the way it should, and in this regard the saw chains from Stihl are more sensitive than those of other manufacturers. At the same time, you mustn’t sharpen too much as it will quickly become overly aggressive. If you do this right, you have a saw chain that cuts smoothly yet with effiency. Here is a video from the performed test. A classic geek when it comes to forestry and tech. 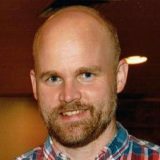 Started skogsforum.se in 2005, have been coding since 1999 and also spent 4 years in a harvester. Lives in Sweden. Very nice video guys, very impressive saw. So with 20 tanks run through the 500i which is roughly three 7 hour logging days...the video shows how dirty it was cutting spruce. Of course spruce or other softwood is messy with sap and lots of dust and after 3 straight days without cleaning maintenance it will be very dirty. But normally a logger would clean it and air filter included after a 7 hour day. This would prevent fine wood dust from working past the over dirty air filter into the intake as the video showed. So it's very important to understand this problem. I agree with you and that is one of the main purposes of these short tests - lets run the saw as long as we can and before sending it back, check how it looks, both in and out. We could be better in explaining that along with the fact that this is a new saw that has not been run in fully. Most likely it will perform better and better after each re-fuel, maybe for as long as up to like 50 re-fuels. development goes all the way back to 1949 at Rasmus Wiig's small Oslo factory "Norsk Sagbladd Fabrikk" with his 8.5kg semi diesel Comet Model A chainsaw. Picco ⅜ chain on a Stihl MS 500i – cutting capacity?